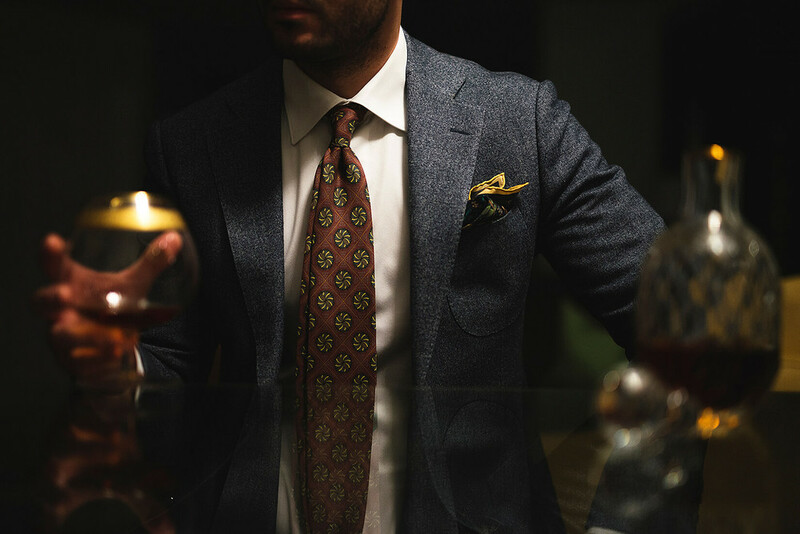 There are many brands launching ties or handkerchiefs online these days, given it’s an easy area to try and express something new - and the lack of sizing makes it relatively easy to sell online. One that was shown to me recently with an interesting approach was R. Culturi. They work with a range of artists to commission original pieces, which are then printed onto silk accessories. 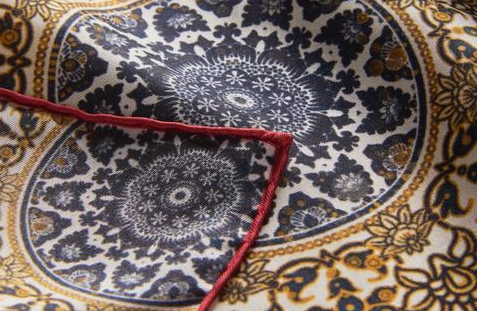 The pieces are relatively well-made, with hand-rolled edges to the handkerchiefs, for example. And there is a more interesting design and colour selection than you get with most collections. Digital printing can have a problem with penetrating all the way through the silk. R. Culturi work hard to improve this, often testing dozens of different options, but this work does mean designs aren’t quite as sharp as they would be with simpler designs. Personally, I prefer the simpler and more graphic designs of classic makers. But I also understand people that are on the other side of this trade-off, and like the more painterly or complex patterns. I tried the copper mandala tie (which is an interesting shade of dusty pink) and both the Tides and Still Life pocket squares. The French sock retailer Mes Chaussettes Rouges have long expanded beyond red socks, but they also added Bresciani underwear and T-shirts to their range last year - and more recently, hard-wearing socks and compression socks. The Bresciani pieces are lovely - a beautiful cotton, beautifully finished. The T-shirts are primarily designed as underwear, but aren’t too transparent to wear on their own, and a have a nice semi-slim cut. The only design point that feels a little underwear-like (and old-fashioned perhaps) is the slightly longer sleeves. But then I often roll these up. The underwear is also lovely, but I’d recommend the loose boxer shorts ahead of the briefs or boxer-briefs. The cotton is not a jersey and has not elastane in it, so I found the latter style a bit in need of stretch. As for the hard-wearing and compression socks, I tried a pair each of these and found them surprisingly comfortable and even luxurious in feel, despite the high level of synthetic content. I wouldn’t wear them regularly, as they would make my feet too hot, but for those that travel and like compression socks, they are a cut above. 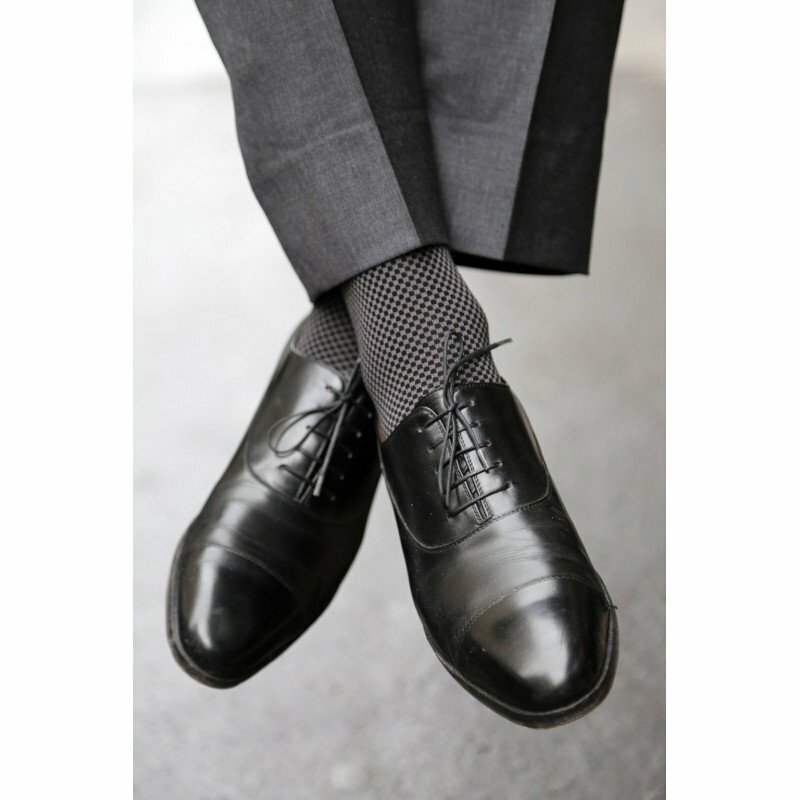 And the super-durable socks will be best for those that do a lot of walking or otherwise wear their hose pretty hard. These posts are largely about new brands, or significant additions from brands we’ve featured already. The T-shirts from Private White VC fall into the latter category. Last Autumn/Winter, PWVC did a small run of merino T-shirts in grey, navy, a great copper and a few other colours. They sold out pretty quickly - with several customers buying the whole range, as tends to happen when men find a basic they love. Merino is not for all-year-round - cotton will always be that touch more comfortable and familiar. But it performs fantastically in colder weather; I’ve often wished I could wear my Rapha base layers more as T-shirts. This season PWVC has followed up the merino range with cotton-jersey pieces in short and long sleeve, and the same colours as the merino plus some new marls. Pochette Square are a handkerchief company I reviewed several years ago - September 2011, in fact. They contacted me recently saying that piece got a lot of play on search engines, but they had improved their product since and would I review them once more. I’m always happy to do this, as brands change their approach and designs over time - and nothing is better than seeing a young brand learn and improve, resolving into a much stronger product. Unfortunately, my major points had not been addressed. The hanks were still too small to stay up in most pockets (13 inches on the side) and most were not hand-rolled. However, they have introduced a greater variation in designs - more in the area between classic and showy - such as the grey linen and some subtle map designs. And for both ties and hanks, they have a big range and very good prices - for those not so bothered by the digital printing or hand rolling. Lastly, I recently tried the accessories from The Morning Company. They do a small range of shaving products in wood and horn, but with some interesting, slightly more modern designs compared to the traditional menswear outfitters. 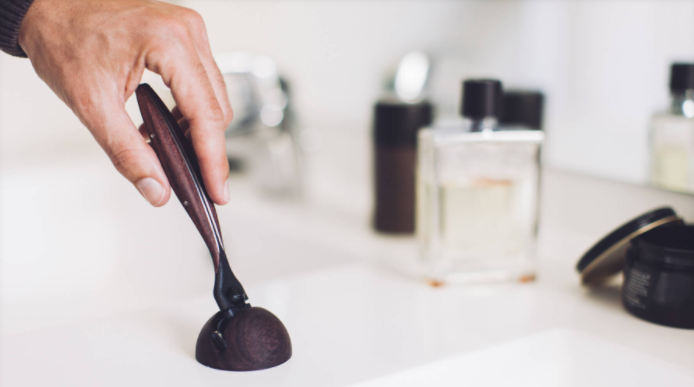 The wooden razor, for example, is handmade in France from a lovely rosewood, but with a metal line running down the middle and a stand that is both attractive and practical (above). I tried one and have replaced my old, horn handle. The toothbrushes, unfortunately, don’t work quite as well as the replaceable heads have to be bought from The Morning Company, and a pretty basic. The horn combs are also a lot more standard. You can follow the discussion on Brand round-up: R. Culturi, Mes Chaussettes Rouges, Private White, Pochette Square, The Morning Company by entering your email address in the box below. You will then receive an email every time a new comment is added. These will also contain a link to a page where you can stop the alerts, and remove all of your related data from the site. The razor looks nice but its a shame they only support the Mach3 blades. The upgraded Fusion range came out in 2006 so feels enough time for them to have updated/ brought out the other fitting. L’Occitane/Plisson do a wonderful wooden handle for the Fusion. Bought one recently for around the €60 mark. Handcarving handles for Gillette blades is like designing the The Permanent Style valet stand especially for flipflops and plastic tops from H&M. Just wrong. I get the sales side of it but still…. Go for safety razors or knives, gentlemen! Lucas, I’d always assumed cartridges (like Mach 3, etc.) were much more convenient and easy to use than a safety razor (although I’ve never used one myself). Are there any benefits, besides aesthetics, you could share with us? Thanks Lucas, I think you’ve convinced me to give it a go! I agree with Lucas. Safety double edge and single edge (i.e. cut-throat)razor blades work differently from cartridges. Cartridges push the skin down and almost pull the hair out, whilst safety razors blades cut the beard without removing the beard. I used to have loads of ingrown hairs, rashes etc. until I switched to traditional double edge razor blades. They are also cheap – approx £3.50 for a pack of 10 Feather brand blades – and the razors (e.g. Merkur) will last a life time. The price of the pictured R Culturi tie is £109. An absurd margin given their business model. Why do these deluded, new entrants (they aren’t the only ones) persist with breaking into the tie market? The mind boggles. But I do know the cost per unit for the manufacturing of a tie in Northern Italy. Considering that cost, there is no way that such additional artist related costs can justify the price in the context of their business model. Thanks Gus. I know what you mean, but I don’t like such simplified breakdowns of price and presumed margin. If that were all we cared about, zero time and money would ever be spent on design, on prototyping, on research, on quality control, on stock carry and storage etc. On Permanent Style, I run at an average of one failed collab to every one that’s successful. The failed ones were just not good enough, despite months of work, travel, communication and so on. Should the purchaser of a successful collab pay for that, or not? Completely agree with your point on this interesting exchange with Gus. It is interesting to read about your ratio of successful versus “failed” collaborations. I always had the impression that the products offered are very good and interesting, the only time I would not buy them is because my personal style does not correspond, as, for example I never use cuff links or do not appreciate polo shirts. Thanks Laurent, good to hear. My basic approach is that everything Permanent Style does should stand to increase its credibility and value, never diminish it. Hence the failure rate. Simon, how do the Bresciani T’s compare to the Zimmerli you reviewed some years ago? The Zimmerli T’s are definitely underwear, but as with their briefs I’ve found them to be incredibly hard wearing and actually very good value for money despite the large initial outlay. These aren’t at the same level as Zimmerli, really just in terms of the fabric. In terms of style, the Bresciani are more T-shirt like and able to be worn on their own. I agree with the Zimmerli hard-wearing, but can’t comment on the Bresciani as I haven’t worn them long enough yet I’m afraid. Since we are on accessories here, I hope it isn’t out of place to ask about scarves. What do you think about tucking woolen scarves under the shirt collar, as if they were ascots? I heard that it’s fine if they were silk, but what about wool? I don’t quite like the look of certain ascots, although I think a woolen scarf adds a bit of “pomp” when tucked under the shirt collar, at the same time keeping me warm in autumn. Personally I don’t like it – the maximum I would do is have the scarf under the shirt collar, but then come out over the front of the shirt.